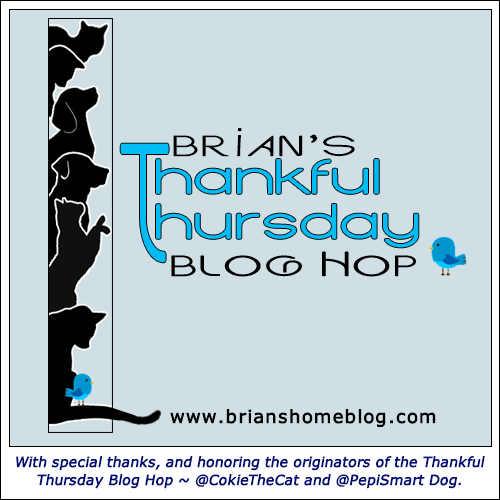 Welcome to our Thankful Thursday Blog Hop, we are sure happy to see you today. Y’all know that each and every Thursday we post about things we are thankful for and we always look forward to doing it along with you. We sure do look forward to reading about all of the things you are thankful for and we sure love it when we see new blogger pals hopping in to join us! Today is going to be somewhat short and sweet since the Dad is still a little out of it from his dental surgery. Everything came out okay and now it’s time for the healing up part to begin. We sure are thankful that the Dad will be okay again soon. We would all like to send our purrs to all of those in the path of Hurricane Florence. It looks like it’s going to be quite a mess on the East Coast and inland for the Mid-Atlantic States. Y’all be safe, we’d be most thankful for that. Gosh! Your Dad had a dental!?!? I am sending healing purrs. I guess it is as tough for human as it is us cats! We’re glad Dad is doing okay after that dental! We know you kitties will help him heal up really good. Hugs! Oh no…they got your dad too! At least he wasn’t neutered and had surgery on his toothies. Hope you feel really good soon. Did you get drugs too? Me’s feel like I have no feet with them. We are thankful your dad’s dental surgery went well. Hoping for quick healing. We know so many people in Florence’s path, and we are purring for all of them! I am glad your dad’s dental went well and hope he has a good recovery from it. My thoughts are with all those in the path of the hurricane. We are happy that your Dad is doing well after the dental surgery. We also purr for all in the path of that hurricane. We purr you will be safe too! Glad your Dad is OK and like you, we are hoping the storm doesn’t cause any loss of life as it rumbles ashore today. Ugh! Dental surgery is awful! So glad it went well! Hope he feels back to his old self soon, without the dental issues that is. So glad the surgery went well. That is no fun, that dental stuff. Let us know how it goes with you with the hurricane. We are really going to need the ark for this one. Have a good day. We hope your daddy gets to feeling better real soon! Give him purrs from us! I hope your Dad heals quickly. Thanks for hosting. Dental stuff is no fun. We’re purring that your dad is feeling better soon. I have observed that dental surgery is disruptive and can take a day or so – purrhaps even longer – for a staff member to get back to normal. Katsu and I shall do our best to purray for your dad. Brian, dear furiend, thank you for taking the time to host this hop despite the need to tend to your staff. Ooh noooooooooooooooo not dental surgery… we are sorry to hear that and Mom sure does know how bad that can make you feel. She’s had her share of it and her theory is since the toofers are so close to the brain everything in the mouth hurts twice as bad. Brian, you kitties make sure to give your dad lots of purrs and snuggles; it will make him feel so much better! I’m thinking that he is feeling grateful today, #1 for that dental stuff to be in the rearview mirror, and #2 that he has furry love to nurse him along. We’re glad everything went OK for your Dad, and hope he heals quickly. Today we are thankful to be seeing some sunshine after a few days of rain. But we are really thinking of all of those in the path of the hurricane, and pray everyone stays safe. Glad that dads surgery went well. Today I am thankful that I woke! Haha…..actually I am thankful for being retired and being able to veg on my deck with my coffee, my furbabes and watching the peaceful fluttering of the hummingbird as it feeds. I am so glad that your dad is now in the healing stage. I hope that he feels well very soon. Sending POTP to him. Get better soon, Brian’s dad. Tooth pain, even recovery pain is not at all nice. On the plus sie you get to eat all the nice soft and sweet stuff, like ice cream and jelly and niptinis. oh my- tell your Dad to take it easy! Hope he is 100% soon! We’re happy all went well with the dental work on Dad. Now just to heal. Wishing that is all better soon. Healing purrs for your Dad and his teeths. Purrs for all of our friends on the East Coast we has our paws crossed the bad hurricane doesn’t do much damage. Stay safe we loves all of you. We hope today has Dad feeling even better from his procedure. Meanwhile we are also sending lots of good thoughts and prayers your way for you to be safe and damage-free from Florence. So glad to hear the dad is doing alright. We are sending lots of healing snuggles your Dad’s way and hope he feels better real soon! Take good care of the Dad, kitties! We are glad Dad is doing well after his dental procedure. Now he can relax and have your lovely purrs to make him feel better. We hope everyone is safe or has gone away from their homes with the hurricane coming. Thanks for the share. Feel better Dad. We’re so glad your dad’s dental went well! Please be safe during Florence! We’re sending positive thoughts. My post is a more sarcasm than grateful so I’ll just say it will pass dad and you have so many fur babies to help you through it. I really hate the dentist, especially since they got that new water pic drill thing for cleanings. Warm milk and sandy kisses, dad. I’m so glad your Dad is OK and healing well. I had great plans for an awesome Thankful Thursday post…..and now it’s Friday. Oh well. Happy the dental visit wasn’t too painful and Dad is on the mend. Between myself and our two daughters, we adopted five cats between the three of us 13 years ago. Three are still with us. Two are waiting at the Rainbow Bridge. Take care. I’m thankful those air ducks are gone and so are the humans. Sending healing purrz to the dad. Human dentals are rough too. Hope you guys are far from that Florence. I’m sorry we’re so late to visit! We’re so glad that Dad Terry’s dental surgery went well. We’re also glad that he has such purrfect nurses as you kitties. 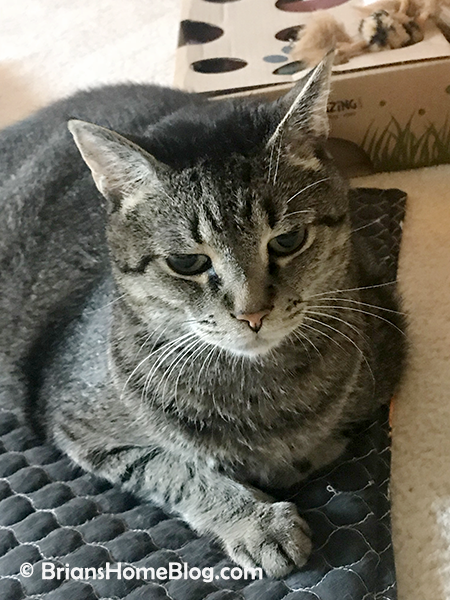 We’re sending purrs and prayers to all those affected by Hurricane Florence. I have had enough dental work of various kinds that I can really sympathize with your Dad!